I had the good fortune of spending time with Aberdeen Group's Director of Research for Service Management, Sumair Dutta yesterday at ClickSoftware's ClickConnect 2012 event. He shared a couple of interesting points with me. The biggest ROI available for most field services organizations is the "First Time Fix" goal. This is when the service technician can fix the problem the "first" time on the job. There is so much time wasted going out to a job, evaluating it, ordering parts and rescheduling to come back at a later date. The expense doubles when you can't fix it the first time. Think about the wasted time, fuel, lost opportunity costs and poor customer service. How does mobility fix this? It doesn't unless you connect the right back-end systems together. You want to be able to see the customer's history. You want to understand the equipment that needs to be repaired. You want to have the right tools, certifications and parts with you. 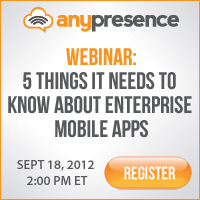 All of these things require integrating back-end systems with your mobile application. When this is accomplished, you can get it right the first time. Only 64% of large companies have mobilized their field services organizations? Only 59% of medium companies have mobilized their field services organizations? Only 44% of small companies have mobilized their field services organizations? I predict that many of the large companies that have already mobilized, will be looking for a refresh of both hardware and software in the next 36 months. The market is wide open and the vision of what is possible is far greater than ever before.